I’m excited! 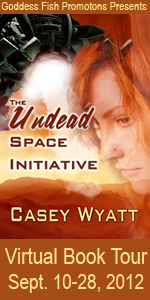 I start my very first official Virtual Book Tour for The Undead Space Initiative. For Mystic Ink, I scheduled all the blog stops myself and quickly realized (far too late) that I am really not good at writing a zillion unique blog posts in a short period of time. And it totally killed my writing schedule. So this time around, I decided to hire Goddess Fish to the do the work for me. They also set up an interview only tour. While I had to answer at least 2 interviews a day for a solid week and half (and it was a bit much), it’s much better than what I did before. I hope you will stop by and leave a comment. 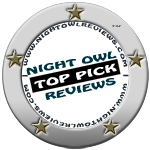 At the end of the tour, I will award one lucky commentor a $25 Amazon gift card and e-book copy of Mystic Ink (either Kindle or Nook version). < No! Not Another One Gone! I did the same thing, Casey. I set up my own tours and it was not only time consuming, but not nearly as effective as it could have been because I didn’t research the blogs well enough to determine the readership. For WANING MOON, I also hired Goddess Fish to set up a one month tour. They’ve been great and it will be a whirlwind tour of about 18 sites during the month of October, but I think it will work out much better this time around. Have fun! It was a bit of work initially, but I am way less stressed out than I was last time around! Best of luck with your tour and with Waning Moon! Good luck with the tour. I know it’s going to be a huge success! Thanks Cynthia! I sure hope so! Good luck with your tour. It’s going to be great. Thank you Janna! I’m kinda of excited. There were some really good interview questions. Made me think! Hey Casey, I have the info to set mine up, but have not decided to take the plunge yet. I heard a few writers praise them, and heard a few horror stories too. I’m on the fence. I may just have to give them a try. I chose Goddess Fish because they had affordable packages and a proven track record with writers I know. I hope it is worth it! I liked not having to search all over for blog sites. Well, it looks like Goddess Fisch is gonna sell some services – including to me, if they adopt the “correct” spelling of their name! Sorry – i’m Ron FisChman – hence the comment. I hit the return key too quickly, before I could wish you luck on your tour! That’s awesome – Ron Fischman! I’ll be stopping by on your tour to comment, Casey. My own tour — also arranged by the fish goddess — begins Oct 15th. I love reading author interviews. In fact, I’m going to host my first ever author interview a week from today. Authors rock! but not quite as hard as READERS, heh heh! Thank you so much Sandra! I appreciate your support. And I will be on the look out for your tour too! And you’re right, readers do rock!! That is so cool Jill!! Yes, definitely – see you soon!